Opportunity to buy a beautifully renovated 3 storey property with two apartments. Close to the picturesque town of Guemene-sur-Scorff, which is steeped in history and aptly named a "Little City of Character". You are within walking distance of the town centre where you have a variety of shops, cafés, banks etc and a weekly market. 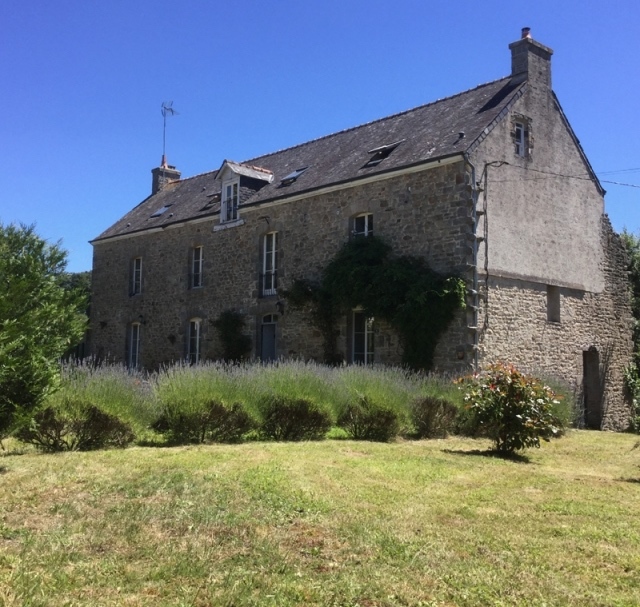 Having all amenities in easy reach, adds to the rentability and would make a great B+B.The property also comes with a double height car port with storage space above (total of 40m2), a wood store and cellar/workshop (50m2). The current owners have created a comfortable and homely property which is finished to a high standard, yet retains feature granite stonework and a mix of chestnut and oak beams throughout. The two apartments also have a high quality finish, providing instant rental opportunities. The manageable garden surrounds the property and due to location there is plenty of parking for your guests. The ground floor comprises an entrance hall with doors off to; on your left, a sitting room with wood burning stove, original wooden floors, beams and attractive exposed stone walls. On your right is an open dining area which leads you through to the kitchen. The kitchen has a range of base units and double gas oven range A light and airy family kitchen, with plenty of space for a table and further benefitting a separate larder / utility room housing, fridge freezer, washing machine and the oil fired central heating boiler. Up to the first floor which has chestnut wooden floors throughout and a good sized landing with a quirky feature railing around the original millers hatch. There are doors off to; three bedrooms , one double and one single sharing a 'Jack and Jill' shower room with w.c.. The second double has an ensuite bathroom with cast iron roll top bath, plus shower cubicle, a w.c. and twin armitage hand basins. Also in here – and neatly disguised behind a shabby chic door - is an electric water balon. On then to the second floor which has a large open room in the centre currently used as an artisits studio, a w.c., and two large bedrooms to either end, one of which has a woodburner installed. This wonderful space is open to the 'A' frames and again original wooden floors throughout. Apartment one; Has access from the front of the house, private garden area and off road parking. Ground floor has an open kitchen / living space with with woodburner and stairs up to a mezzanine double bedroom, single bedroom and shower room. Apartment two is at ground level, accessible at the rear of the property. It comprises; an open plan kitchen/living space with wood burning stove, a bathroom and a double bedroom. This property further benefits from having; double glazing throughout, oil fired central heating in the main house with attractive old style cast iron radiators, original wooden floors throughout, a good roof, broadband French and UK t.v., and manageable garden plot with a stream on the boundary.